LIKE THE "NEW CIRCLES" before them, the "Mysteries" mark a return to a centered image of nested circles. Like the original "Circles" of the late '50s and early '60s, they 're thinly painted, but the paint application and consequent color feeling are substantially different. They're blatantly evocative. Crisp edged circles amidst misty, amorphous penumbras recall eclipses, full moons, hazy suns. 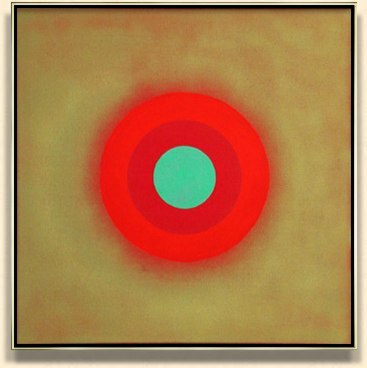 The interactive rippling rhythms of the early "Circles" have given way to radiance, effulgence, expansion. Mysteries: Jamaica, 2001. Acrylic on canvas, 36 x 36 in. The "Mysteries" have taken on a greater amount of evocation than has been present in Noland's art since his first "Circles", surrounded by painterly penumbras, of the late '50s. It's as if abstraction per se no longer matters, is no longer something to be avoided. Still, the Noland of taut, eloquent formats remains. Where the penumbras of the early "Circles" were actively and splashily drawn, in "Mysteries" they're blurred and hazy, fading as they expand. The crisply-drawn circles within them pin down the illusion in concert with the crisp framing edge of the square canvas. In effect the amorphousness of the penumbra is contained and pictorialized by both center and edge. These paintings have nothing to prove. Among the most serene paintings that Noland has made, they're pared down, simple, essentially beautiful.